Have you ever wanted to like a movie a lot more than you actually do? Well, that's basically the feeling I'm left with after watching Joe Lynch's fun but flawed horror/comedy/adventure flick, 'Knights of Badassdom.' With a loving spin on genre conventions and a veritable dream cast of geek icons, the movie has a lot going for it and quickly elicits a genuine sense of goodwill. Sadly, that goodwill has its limits, and the film's mishmash of comedy and gore never really gels, leading to an uneven but occasionally inspired celebration of cult moviemaking. There are moments of genuine "badassdom" here and there, but there's also an unfortunate amount of just plain "bad." And who the hell wants "bad" without the "assdom?!" 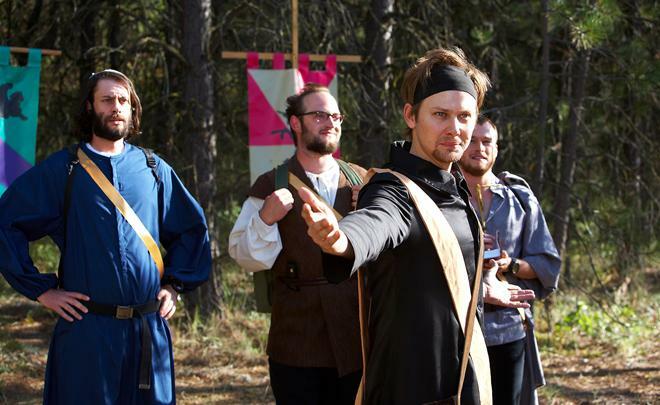 After getting dumped by his girlfriend (Margarita Levieva), Joe (Ryan Kwanten) is dragged to a LARPing (Live Action Role Playing) competition by his friends Eric (Steve Zahn) and Hung (Peter Dinklage). Though at first reluctant to embrace the silly fantasy game, Joe eventually gets into the spirit of things, especially after meeting his beautiful teammate Gwen (Summer Glau). But after a "make-believe" spell is cast, a real demonic succubus is summoned, and soon all hell breaks loose. As bodies start dropping left and right, the role players will have to put their experience points to good use and slay the monster before it slays them. With an ensemble full of genre TV icons and cult favorite actors, the movie instantly establishes a certain level of geek cred. I mean, how can any self-respecting nerd not want to see a flick starring Jason Stackhouse, River Tam, and Tyrion Lannister?! Then throw in Davis McAlary, Paul Kinsey, Liam McPoyle, and Abed Nadir, and suddenly you've got yourself a genuine perfect storm of potential awesomeness. The keyword there is potential, however, and while the unconventional cast is pretty damn cool, the material they have to work with isn't always up to par. On the one hand, the filmmakers do a solid job of poking fun at LARPing without ever being mean-spirited. This is clearly a movie lovingly made by geeks for geeks, and this level of care and authenticity adds an extra layer of heart to the proceedings. Of course, some of the sillier aspects of role playing are still lampooned throughout the runtime, and this style of humor is worth a few decent laughs. Jokes that contrast the players' overly serious dedication to their imaginary fantasy world against the decidedly unimpressive realities surrounding them are particularly funny (Jimmi Simpson's character is especially amusing in this regard). Likewise, there's a certain slacker comedy sensibility that runs throughout the script as well, and these elements offer some solid entertainment here and there. On the other hand, the movie also attempts to blend old school slasher blood and gore into the story, and this mixture of tones isn't always very successful. Kills can get very graphic, and the movie's body county is rather merciless. This darker mood ends up clashing with the otherwise light comedy, giving the film a very uneven temperament. One minute we're laughing about how silly the player's foam weapons are, and the next a character we care about is getting hastily and graphically ripped to shreds. Under the right hands, horror and comedy can mix together very well, but here the script and direction are never quite in sync, and the violence and humor don't ever play off of each other well, resulting in an odd disconnect. Even judged on their own, the bloody set pieces and comedic gags aren't very original, the plot itself is a bit thin and generic, and some of the effects work is a little iffy. The story has a lot of promise, but the filmmakers fail to milk much creativity out of the idea, mostly squandering what could have been a clever adventure flick into a standard horror outing. Still, the director's reliance on old school practical special effects is admirable (even if they can look a tad cheap), and there are some inspired moments peppered throughout, including a genuinely badass climax that should more than please any fantasy and heavy metal fan. 'Knights of Badassdom' is a well meaning love letter to genre filmmaking filled with humor and gore, but it's uneven tone and dull plotting fail to capitalize on what could have been an appropriately badass premise. Originally shot way back in 2010, the flick has had a long and contentious road to release and it's my understanding that the edit presented here was actually completed without the director's involvement. Thankfully, even in its apparently compromised state, there is a fair share of fun to be had here, and the geek dream team cast really is amusing to watch. Also, did I mention that Peter Dinklage plays a stoner who gets high on mushrooms, wears flowers in his hair, and beats people up with a foam sword? In other words, this flick is clearly worth a rental -- even if it can't quite live up to its title. Entertainment One brings 'Knights of Badassdom' to Blu-ray on a single BD-50 disc that comes housed in a keepcase with a cardboard slipcover. After some skippable trailers, the screen transitions to a standard menu. The movie is provided with a 1080p/AVC MPEG-4 transfer in the 2.40:1 aspect ratio. The flick's low budget does shine through, but this is a solid transfer through and through. The digital source is mostly crisp and clean, but noise is visible in darker scenes and banding/false contouring is apparent periodically, particularly during transitions and in shadows and skies. Likewise, the image has a comparatively low grade look to it with a flat sense of depth. With that said, clarity often remains strong, with a sharp picture and impressive fine detail (one can make out every link in the characters' chainmail armor). Colors are also nice and vivid, playing up the fantasy aspect of the story. Contrast is high with bright whites and though a bit muddled in nighttime shots, black levels are decent throughout. Compared to other bigger budget efforts, the video does have a noticeably cheap digital look to, but the resulting image carries pleasing detail and the transfer's technical quirks are relatively minor. The film is presented with an English DTS-HD MA 5.1 mix along with optional English and English SDH subtitles. The sound design lacks finesse and range, but the energetic effects and thumping music work well to ramp up the movie's action and scares. Speech is clear and well prioritized throughout with no technical issues to speak of. The soundstage is fairly wide and spacious, spreading atmospheric sounds (mostly nature effects like birds and crickets) around the room. Likewise, the film's action scenes are bolstered by lively activity and directionality, marked by plenty of sword slashes (both foam and steel), paintball shots, magic spells, and monstrous screeches. Heavy metal also plays a large part in the movie's plot, and the rocking songs come through with solid fidelity and decent low frequencies. With all that said, the mixing can be a little too one-note and flat, with little variance, nuance, and texture beyond the basic design work. The audio isn't very refined or layered, but the resulting track offers a fun and exciting experience when called for. Entertainment One has provided a small but decent collection of supplements, including several quick interviews with the cast and a more extensive Comic-Con panel. All of the special features are presented in 1080p with Dolby Digital 2.0 audio and no subtitle options (unless noted otherwise). Peter Dinklage Interview (HD, 1 min) – This is a very brief interview with the actor discussing the movie's low budget and the script's loving treatment of its genre. Summer Glau Hottie Montage (HD, 2 min) – This is another very quick interview, this time with the lovely Summer Glau. The actress discusses the film's plot and what it was like to learn more about LARPing. Steve Zahn Interview (HD, 1 min) – In this brief interview, actor Steve Zahn shares some insights on the plot and its treatment of horror. Horr-O-Meddy 1 (HD, 1 min) – Here the cast and crew discuss the movies' mixture of horror and comedy, and its old school special effects. Horr-O-Meddy 2 (HD, 1 min) – More cast and crew insights into the movie's genre bending style. Director Joe Lynch Interview (SD, 7 min) - Presented in standard definition, this is a solid interview with the director. Lynch elaborates on the characters, the culture of LARPing, and the film's style and effects. San Diego Comic-Con Panel (HD, 49 min) - Presented in 1080i, this is the movie's Comic-Con 2011 panel featuring the director and cast. The gang of genre actors (tailored made for Comic-Con) all discuss their characters, address the film's LARPing content, and take questions from the audience. Theatrical Trailer (HD, 3 min) - The film's trailer is included. 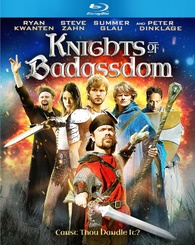 'Knights of Badassdom' is an occasionally fun yet flawed attempt at genre bending filmmaking. The flick's loving mixture of adventure, comedy, and horror has a lot of potential, but the tone never really comes together and the plot is rather thin. On the technical front, though they reveal the flick's low budget, the disc's video and audio are both solid. Supplements are decent as well, including a fun Comic-Con panel and a worthwhile interview with the director. While the movie rarely reaches a level of true "badassdom," its dream cast of geek friendly performers remains fun to watch. Give it a rent.